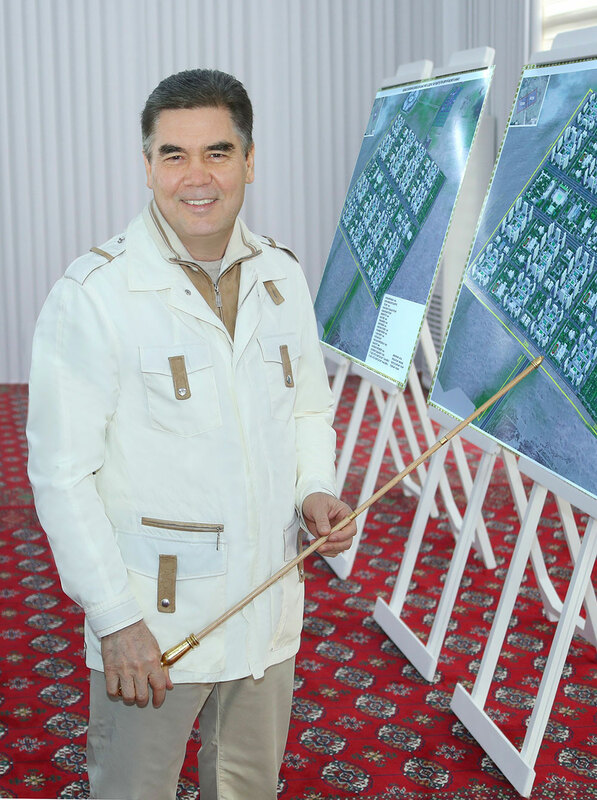 President Gurbanguly Berdymukhamedov is very fond of pointing. There is no counting the number of meetings at which he has been seen forcefully expanding on an argument with his favorite golden-handled and golden-tipped pointing cane. Beyond the bubble in which preliminary sketches of a green-lawned housing developments prevail, Turkmenistan looks like a nation beset by all manner of anxieties. As RFE/RL's Turkmen service, Azatlyk, reported on January 14, almost all the territory on the other side of Turkmenistan’s border with Afghanistan is under the control of anti-Kabul forces. Deadly violence is pervasive. Azatlyk noted that more than 21 members of the Afghan security services were killed on January 8 in a coordinated attack on two checkpoints in Badghis province, near the Turkmen border. At least 15 Taliban fighters were killed as well. The fresh ascendancy of the Taliban is not necessarily of immediate concern to Ashgabat, since the movement is national in its focus, but unending turbulence in Afghanistan will do little to instill confidence in Turkmenistan’s vision of reaping dividends from energy exports to that country. And the Turkmen government is showing signs it wants to be ready for an extreme-case scenario. The Chronicles of Turkmenistan, a Vienna-based new website, reported that the Defense Ministry has ordered all males employed by the state to verify their military registration. Current Defense Minister Begench Gungogdiyev was appointed to the post in June, following a stint as head of the border guard service. In another curious and unexplained security-related incident, officials in Uzbekistan on January 12 reportedly revealed that they had discovered an explosive device on a freight train arriving from Turkmenistan. Nothing more was revealed in any of the Russian and Uzbek media reports on the episode. If security officials are worried about external and/or internal threats, Berdymukhamedov evinces no obvious sign of concern and is instead providing leadership through his usual frippery. So it was on January 9 that he conducted an offsite working session with members of his State Security Council at an Interior Ministry facility. The venue in question was billed as a livestock farming complex, although it appeared simply to be a barn. Going by state media reports, the main topic of discussion for the day was the Interior Ministry’s gift to Berdymukhamedov of an Akhal-Teke foal, born fortuitously on New Year's Day. The young horse has been named Rovach, prosperity in Turkmen, in tribute to 2019 being officially designated the year of Turkmenistan: Land of Prosperity. 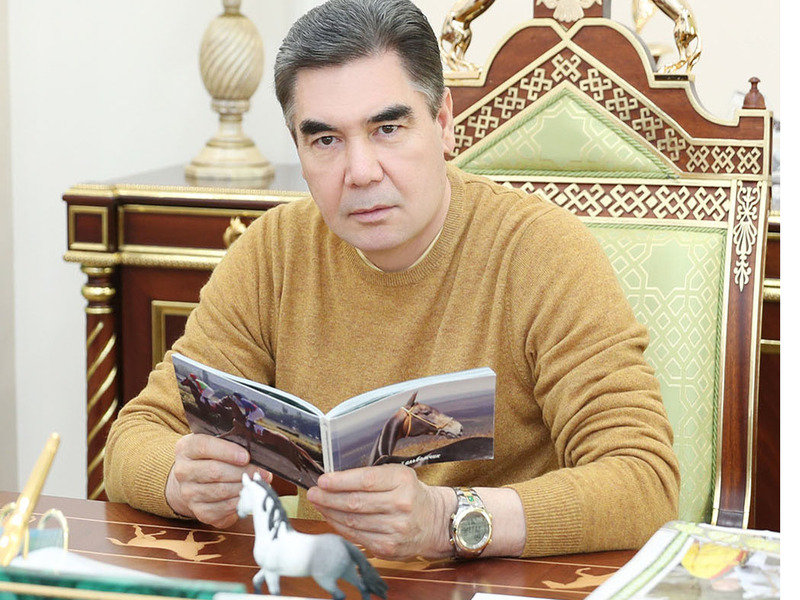 The president was so moved by all this that he spent the subsequent day visiting the Akhal-Teke breeding complex in Ashgabat "to devote some time to writing in his study." He then composed a poem dedicated to Rovach that was splashed across the front page of Neutral Turkmenistan state newspaper. He then recited the poem to his Cabinet later that day. Footage on state media showed his ministers diligently taking notes and then applauding uproariously. It might be going too far to assert that these antics suggest Berdymukhamedov aspires to demigod status, but it is fair to point out that the space for genuine religious practice is suffocating. Azatlyk has reported that police in the Lebap and Dashoguz provinces have been routinely bringing believers in for questioning on the grounds that they regularly attend mosque and engage in similarly suspicions behavior. Those called in for questioning reportedly had their cellphones inspected. Labor migrants are often subjected to the same phone inspections and interrogations. But that does at least mean they got to leave the country in the first place. Turkmenistan heavily restricts its citizens’ ability to travel and regularly imposes arbitrary bans. Reports of people offering bribes to secure Russian visas or other documents enabling travel are growing in frequency. Even those who make it through all the many checks at Ashgabat’s falcon-shaped, multi-billion dollar airport cannot breathe easy until the plane is in the air. Azatlyk has reported that more than a dozen people were pulled off a Turkmenistan Airlines flight to Frankfurt on January 5. Where Ashgabat is reluctant to see people go abroad, it enjoys boasting that its trade balance indicates that more of its goods are making it to the outside world. A report on Ashgabat-based news website Orient claims food exports rose 60 percent in the first eleven months of 2018. While this might normally be indicative of success, the data point really only highlights the government’s indifference to its own people’s hardships. Last year saw never-ending reports of nationwide food shortages. The same should be expected in 2019. On January 8, Azatlyk carried an item about a spotting of more breadlines in the Lebap and Mary provinces. Authorities are regardless claiming more triumphs in their import-substitution agenda. Orient cited data from the State Statistics Committee, a body whose commitment to veracity is object of considerable doubt, to make all manner of confused claims about the collapse in the volume of soft drink imports. One way the ostensibly foreign product is being held at bay is through the allocation of production franchises by global conglomerates like Unilever. In November, regional media reported that a local company, Akdaş miwe içgileri, had begun producing bottled ice tea under the Lipton brand. Snippets of news like this illustrate who it is that is benefitting from the purported emergence of an entrepreneurial class. The director of Akdaş miwe içgileri, Orazmurat Babayev, served in government as recently as 2010. Where franchises prove impossible to secure, Turkmen companies resort to the time-tested method theft. Photos of the wrappers of chocolates available on the Turkmen market posted by the Chronicles of Turkmenistan show that they are shameless copies of beloved Western and Russian brands. It isn’t just foreign tea- and chocolate-makers that Turkmenistan is making do without. Berdymukhamedov on January 11 signed a decree granting privately owned Turkmen Awtoban clearance to build a 640-kilometer highway from Ashgabat to Turkmenabat. Work is beginning this month and should conclude in December 2023. Although Turkmen Awtoban is described as coming from the private sector, it would probably be better to describe such enterprises as parastatal. It and Akdaş miwe içgileri both operate under the aegis of the Union of Industrialists and Entrepreneurs of Turkmenistan, which is ostensibly a lobby group but actually hand-holds all major private-sector players. There is no easily available information about who controls and owns Turkmen Awtoban, but whoever that is is likely to make quite the killing. In March 2018, Orient reported that the government had granted the Union of Industrialists and Entrepreneurs of Turkmenistan $2.4 billion in loans to complete the highway. That translates into almost $4 million per kilometer – a stunning amount for a road to be built in a mostly flat and empty country populated by countless desperately unemployed people.